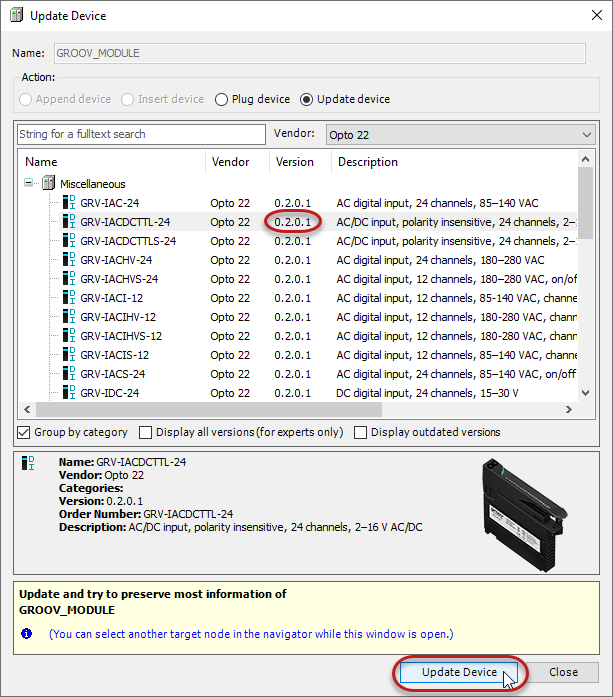 There are six steps to verify and update the groov I/O modules’ firmware, called Opto 22 packages. 1. Click on the module tab (or double-click the module in the Devices Tree), and click on the Information section. 2. 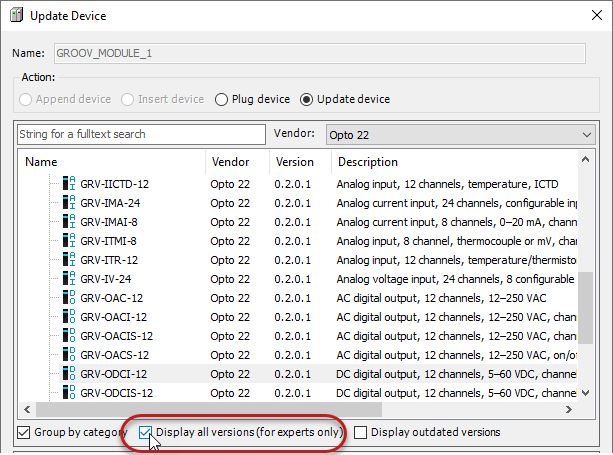 To update the device (module), right-click the module in the Device Tree, and select Update Device. 3. If the latest version in the Update Device window is newer than the version in the Device (module), click Update Device. In this example, the firmware version in the module is the same as the version that’s available in the Opto 22 Library Package. No need to update this module. Note: By default, only the newest version is shown. If you wanted to see past versions, you could check Display all versions (for experts only). 4. Check the other modules’ firmware versions and update them if there’s a newer version. 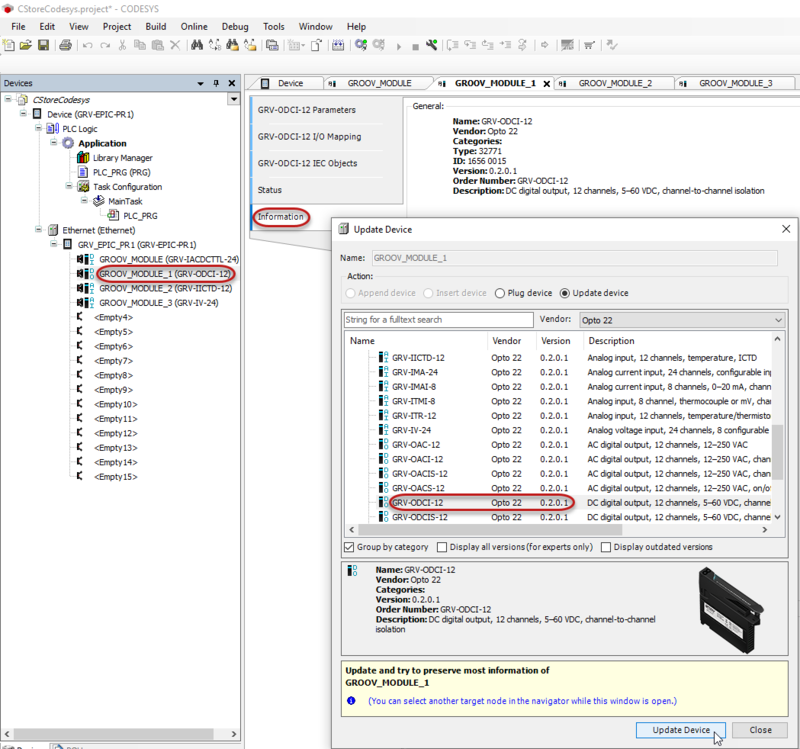 a. Double-click each module in the Devices Tree. b. Click the Information section. c. Move the Update Device window so you can see the Device (module) information. d. Click Update Device if there’s a newer version. 5. Check the controller’s firmware as well. 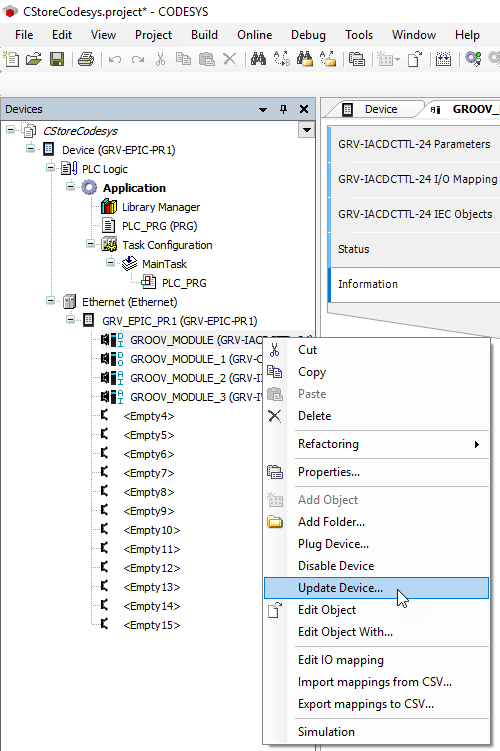 a. Click GRV_EPIC_PR1 (GRV-EPIC-PR1) in the Devices Tree. c. Click Update Device if there’s a newer version. 6. Click Close from the Update Device screen. Steps to update the module and controller firmware.